There has been a lot made in the recent weeks about the Muslim history of my family. Some of the things that have been said are true, others are false, so I am writing this letter to clear up the misunderstandings on this issue. Yes, it is true that I have a name that is common amongst Kenyan Muslims where my father came from and that my middle name is Hussein. Barack is a name which means "blessing" and Hussein is a masculine form of the word beauty. Since there is nothing inherently wrong with the concept of blessings from God and the beauty He creates I fail to see the problem with these names. Some will say wouldn't it be a problem to have a president with a name similar to the deposed and executed former dictator of Iraq ? My answer to this is simply no; rather it is the strength and beauty of America that the son of an African man with a "funny sounding" name, born under British Colonial Rule, can now be a serious candidate for the presidency of the United States . My father was a Muslim and although I did not know him well the religion of my father and his family was always something I had an interest in. This interest became more intense when my mother married an Indonesian Muslim man and as a small child I lived in Indonesia and attended school alongside Muslim pupils. I saw their parents dutifully observing the daily prayers, the mothers covered in the Muslim hijab, the atmosphere of the school change during Ramadan, and the festiveness of the Eid celebrations. The man my mother was married to was not particularly religious; but he would attend the mosque on occasion, and had copies of the Quran in different languages in the home, and books of the sayings and life of the Prophet Muhammad. From time to time he would quote Islamic phrases such as "no one truly believes until he wants for his brother what he wants for himself", "oppression is worse than slaughter", and "all humans are equal the only difference comes from our deeds". Growing up in Hawaii with my mother and her grandparents Islam largely escaped my mind. My mother installed in me the values of humanism and I did not grow-up in a home were religion was taught. It was later while I attended college at Columbia University and Harvard Law that I became reacquainted with Muslims as both schools had large Muslims student populations. Some of them were my friends and many came from countries that our nation now has hostile relations with. The background I had from my early childhood in Indonesia helped me get to know them and learn from them and to me Muslims are not to be looked upon as something strange. In my experiences up until college a Muslim was no less exotic to me than a Mormon, a Jew, or a Jehovah's Witness. After college I settled in my adopted hometown of Chicago and lived on the South Side and worked as a community organizer. Chicago has one of the largest Muslim populations in America (estimated to be around 300,000) and Muslims make-up some of the most productive citizens in the area. I met countless numbers of Muslims in my job as an organizer and later on in my early political career. I ate in their homes, played with their kids, and looked at them as friends and peers and sought their advice. Therefore, when the tragic terrorist attacks of 9-11 occurred I was deeply saddened with the rest of America , and I wanted justice for the victims of this horrific attack, but I did not blame all Muslims or the religion of Islam. From my experience I knew the good character of most Muslims and the value that they bring to America . Many, who did not personally know Muslims, indicted the entire religion for the bad actions of a few; my experience taught me that this was something foolish and unwise. Later I had the chance to visit the homeland of my father and meet Muslim relatives of my including my grandmother. I found that these were people who wanted the same things out of life as people right here in America and worked hard, strive to make a better way for their children, and prayed to God to grant the success. This is what I will bring to the office of the Presidency of the United States . I will deal with Muslims from a position of familiarity and respect and at this time in the history of our nation that is something sorely needed. 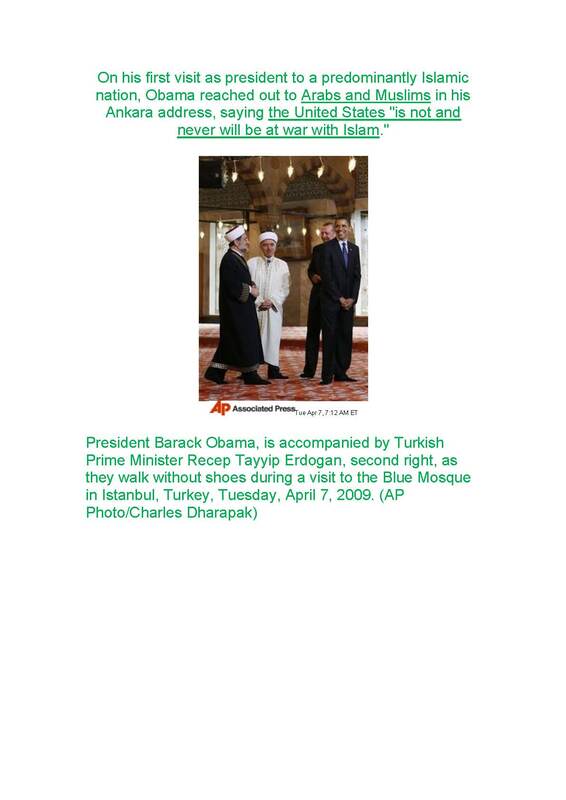 On his first visit as president to a predominantly Islamic nation, Obama reached out to Arabs and Muslims in his Ankara address, saying the United States "is not and never will be at war with Islam." 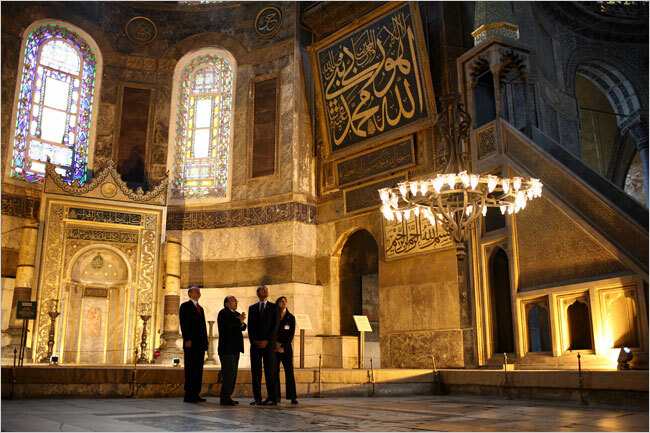 The Sultan Ahmet Mosque (Blue Mosque) built 1609-1616, is at the center of a complex of Ottoman buildings. 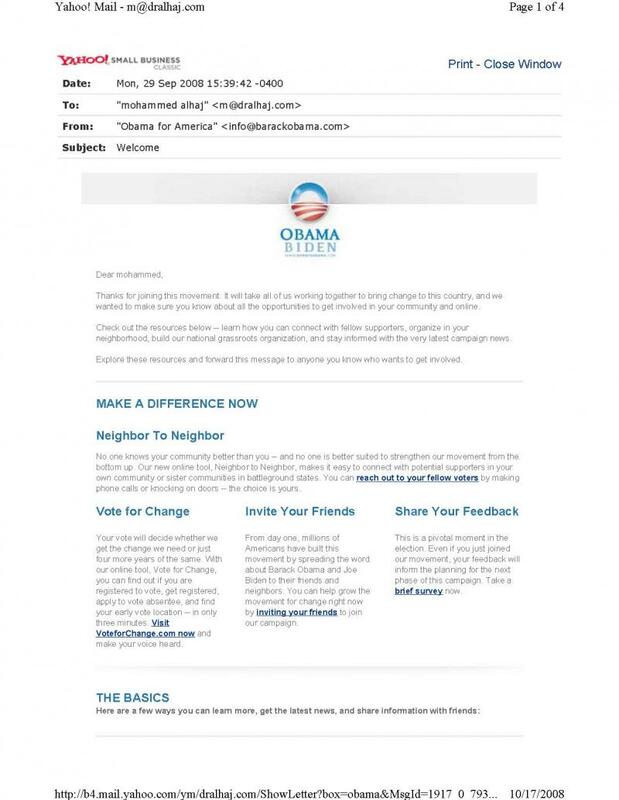 I had received a congratulation email from the elected president OBAMA-CAMPAIN AT WENSDAY 5th, Nov. 2008.